Christmas may be over, but the holiday celebration season is still going strong through New Year's Eve. If you're entertaining this New Year's Eve or perhaps attending a party, don't arrive empty handed! 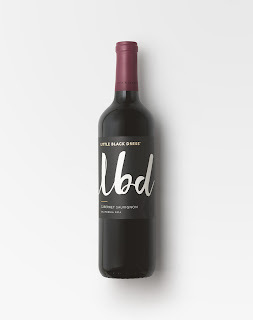 A bottle of wine makes a great gift and doesn't necessarily need to break the bank. If you're looking for an inexpensive bottle of wine, here are my picks for 10 that you can typically find for under $20. Many are available at your local grocery/liquor store or can be easily ordered online. I've also included some handy recipe pairing ideas as well. 1. 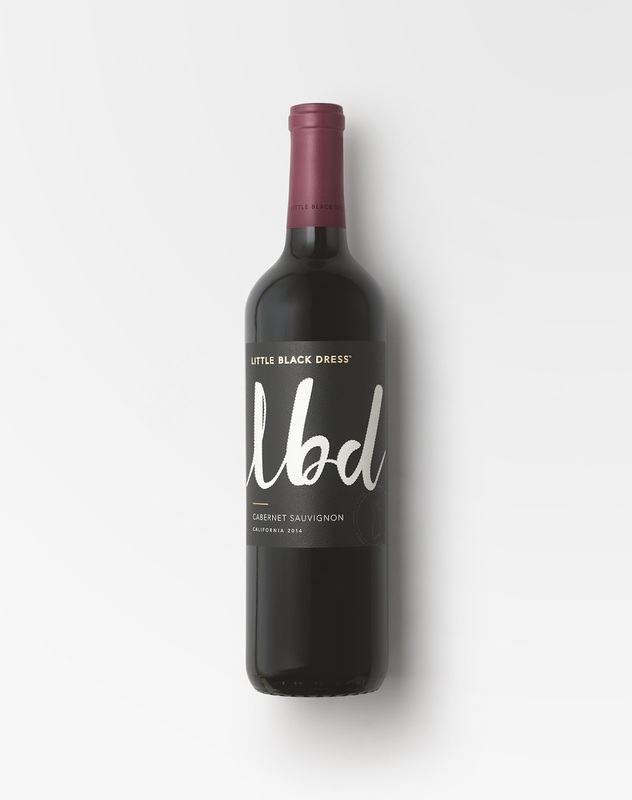 LBD Cabernet Sauvignon - Little Black Dress aims to make wines that are "affordable, approachable, and delicious." Perfect, right? I'd recommend the Cab-- A rich oaky wine with notes of berry and vanilla. 2. Charles & Charles Rose - A brightly acidic rose with fruity notes like watermelon and citrus and earthier notes like grass and wet stone. 3. 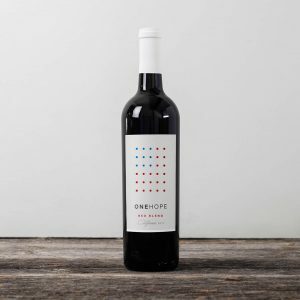 OneHope California Red Wine Blend - This red blend has bold fruitiness like black cherry and boysenberry, and notes of oak, black pepper, and black tea on the finish. Even better? Every bottle purchased "helps veterans continue their service through disaster relief." 4. Predator Old Vine Zinfandel - Smooth, spicy, almost a little smoky with notes of juicy berry. 5. Juve y Camps Pinot Noir Brut Rose - One of my favorite sparkling wines: This Pinot Noir Cava from Spain has notes of apple, strawberry, and almond with a nice creamy finish. 6. Honig Sauvignon Blanc - One of my favorite wines from one of my favorite wineries in Napa: This Sauvignon Blanc is dry with notes of grapefruit and tropical fruits and lemongrass. 7. Mark West Black Pinot Noir - This Pinot is smooth and a little more full bodied than its less expensive brother (Mark West Pinot Noir, minus the "Black"). You'll taste vanilla, mocha, caramel, and rich fruits like black cherry and plum. 8. Adler Fels Chardonnay - Full bodied, fruit-forward with bright acidity-- it's not your average Chardonnay. 9. The Show Malbec - This Argentinian red features dark fruit flavors with slight acidity, characteristic of wines from this region. 10. 2 Lads Late Harvest Riesling - From my favorite northern Michigan winery, this Riesling has bright acidity and the late harvest means it is on the sweeter (but not syrupy) side. 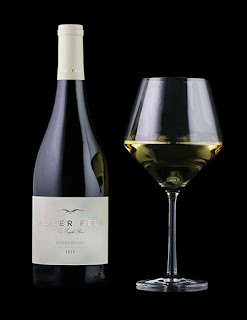 Editor's Note: Complimentary samples of Adler Fels and LBD wines were provided in order to facilitate this post. Thanks for supporting the brands that support A Squared! 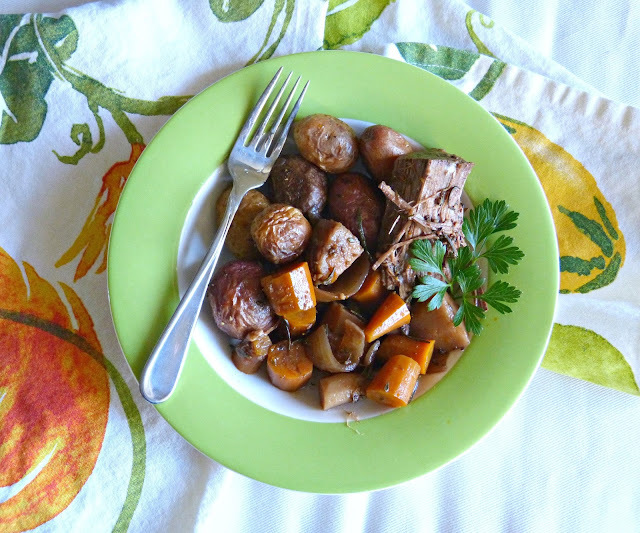 A slow cooker pot roast is the perfect dinner for a cold winter's night-- and it couldn't be any easier to make! Winter has arrived here in Chicago. And it is not messing around. While it seemed like it took its time to arrive this year, it arrived with a vengeance and we've already seen three snowstorms and a handful of single digit temperature days. Needless to say, we've been spending a lot of time indoors these days. 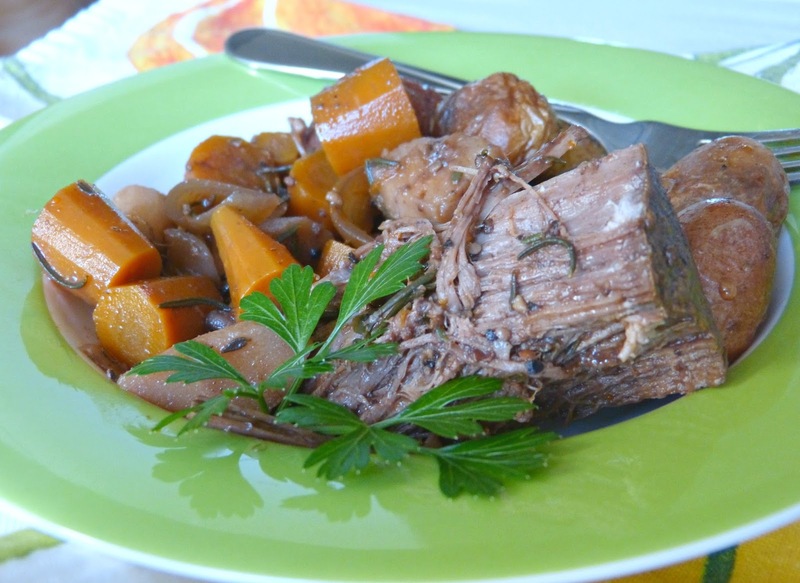 When you're forced to stay indoors (as you might be over the coming days or weeks) there is nothing better than real comfort food-- and it is hard to beat a pot roast on a cold winter's night! A few weeks ago-- before the crazy cold rolled in-- my parents came to town for a few days to visit with us and to babysit for Hannah while Alex and I attended a wedding. They were coming in on a weeknight and were set to arrive shortly after I got home from work. I wanted to make sure that we'd have a nice welcome dinner and that I wouldn't have to spend a ton of time slaving over it when they showed up. I decided to make a pot roast because it's an easy dinner to make in a slow cooker to feed a crowd-- even a small one. 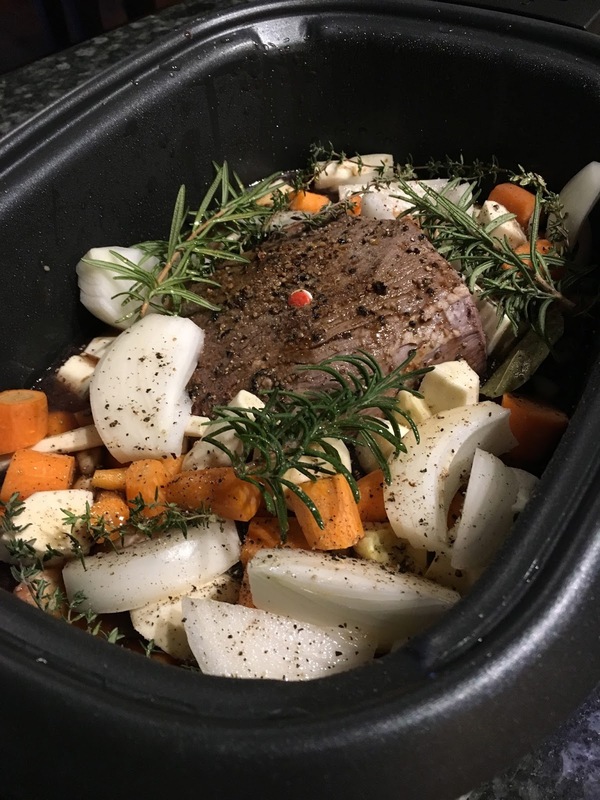 I also love a pot roast because the longer it cooks, the more the flavors develop-- especially using a few good ingredients to build those flavors like red wine, Worcestershire sauce, beef broth, fresh herbs, a little tomato paste (which thickens up the liquid and adds some acidity), and a little hot sauce to create a simple, yet flavorful cooking liquid. I like to sear a roast-- or beef, in general-- before adding it to a slow cooker. That browned outside adds wonderful flavor (especially when you rub in a good seasoning before browning) and then slow cooking afterward ensures that the meat doesn't dry out in the roasting process. Along with the roast, I added sliced onions, carrots, and parsnips to the slow cooker. Root vegetables are dense so they hold up nicely when being cooked for several hours in liquid. 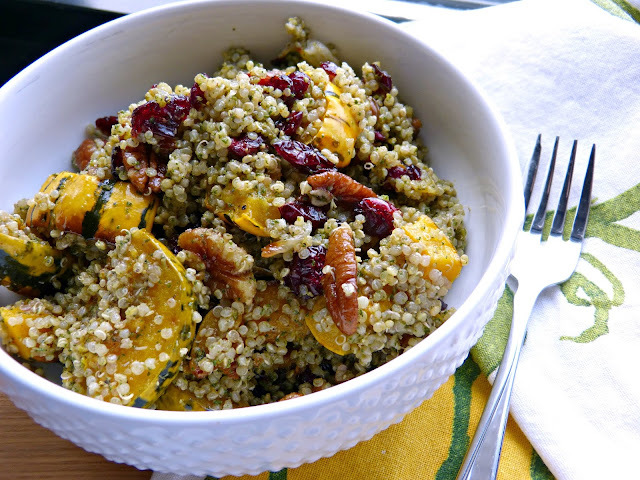 They also soak up that cooking liquid, lending wonderful flavor to both the meat and the veggies! In the past, I've always added halved potatoes to my slow cooker pot roasts but I opted against that this time and it was a great choice! Potatoes are bland and they get mushy in the slow cooker, so I wanted to serve them in a way that enhanced this meal a little more. So instead of adding them to the slow cooker mixture, I halved several baby potatoes, tossed them in some olive oil with salt, pepper, and herbs and roasted them in the oven until crispy. 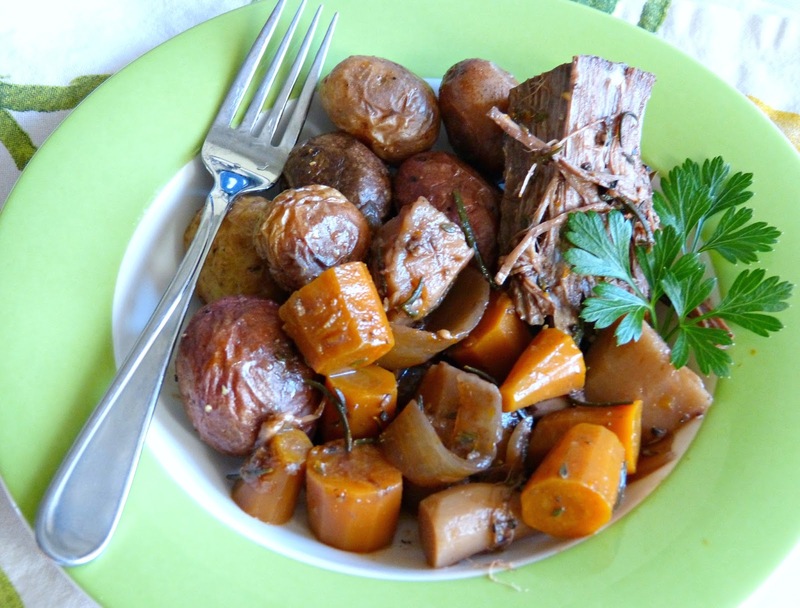 Those crispy potatoes were a wonderful complement to the tender beef and vegetables and I'm pretty sure after eating it this way, I'll never add them to the slow cooker again! Heat canola oil in a large pan over medium high heat. Rub the roast evenly with seasoning and add to hot oil. Sear on each side until browned. Transfer to the base of a slow cooker. Add the onion, carrots, and parsnips to the slow cooker. In a separate bowl, whisk together red wine, broth, tomato paste, Worcestershire sauce and hot sauce. Season with salt and pepper. Pour evenly over the top of the meat and vegetables. Add the rosemary and thyme sprigs as well as the bay leaf to the slow cooker mixture. Cover and cook on low for 7-8 hours. When ready to serve, remove the herb sprigs and the bay leaf from the pot. Serve over potatoes, egg noodles, rice, or polenta. 1. Great coffee without leaving the house - Coffee is a necessity for new moms, but good coffee is a luxury. I would have loved (and would still love) this Ninja Coffee Bar Single-Serve System, which makes tons of different coffee recipes one cup at a time without the wasteful pods. 2. A stylish diaper bag - If you're going to haul around a bag full of diapers, rash cream, and breast pads it might as well be cute. It should also be functional too though and our Kate Spade Baby Bag comes along everywhere that Hannah and I go. It's big enough to hold all the things (and then some), has several interior pockets for organizing, and a folding changing pad. 3. A sentimental piece of jewelry - This engravable Stella & Dot necklace is the perfect way for mom to commemorate a baby's birthdate and to keep if close to her heart too. It can also be engraved with initials or geographic coordinates too! 4. A chic winter nursing cover alternative - As you know from some of my previous posts (here and here and here), I'm a a proponent of nursing but also a fan of doing it discreetly. In the winter a stylish blanket scarf (like this one from Anthropologie) is the perfect accessory for fashion and two functions: it will keep mom warm and double as a nursing cover when she's out and about. 5. Stroller storage solutions - One of the hardest things about getting out the door with baby in the stroller is trying to figure out where to stash all of your stuff. It's a pain to have to dig your wallet, keys, and phone out of the undercarriage compartment every time you need them, but you're not always wearing something with pockets. This cute storage system from Skip Hop can hook on to the top of almost any stroller so mom has a convenient place to store all of her things when she's out with baby. 6. 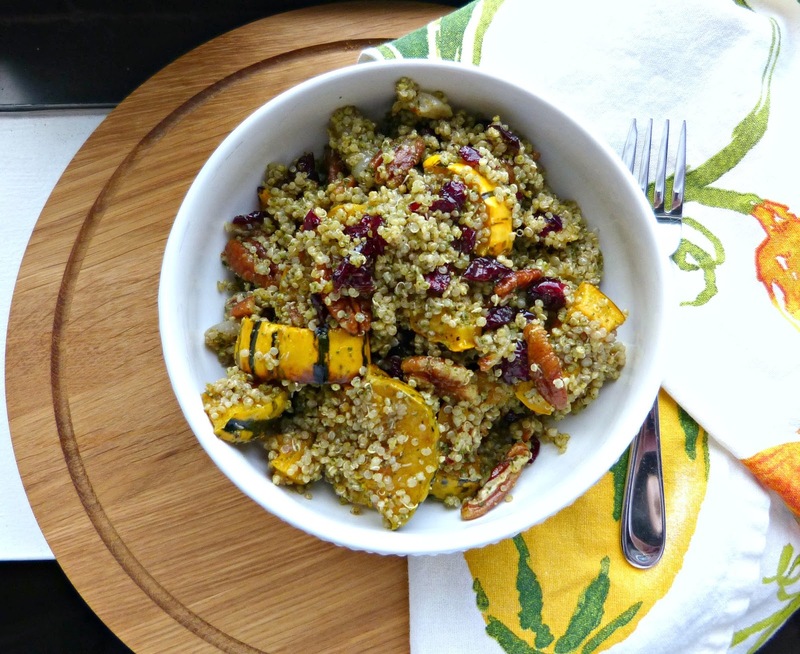 A dinner solution that does not involve delivery - Thank goodness for a slow cooker or for these first several months of motherhood we'd either be dining on takeout every night or not eating anything! Making dinner at home can be a struggle when juggling a newborn's unpredictable schedule, so a slow cooker is a lifesaver. I have this Cuisinart model and love it-- you can brown your food in it before starting the slow cook process which yields better flavor and one less pan to clean! 7. A chewable piece of jewelry - My Hannah puts everything in her mouth these days, but she's especially a fan of jewelry. I have a Chewbeads necklace already, but love these colorful teething bangles as another option. Hannah also likes to "wear" ring-shaped toys around her wrists, so these are a great baby-safe alternative for that too! 8. TLC for winter (and hormonal) skin - My skin is already crazy dry at this time of year, but add in the new postpartum skin issues (hello, bumps!) I have experienced in the past several months and it's just a mess. This coconut scrub is amazing because it is both exfoliating and moisturizing at the same time... like coffee (oh, and wine), a necessity and a luxury for new moms! 9. A cardigan that marries style and comfort - Cardigans are a new mom's best friend-- especially at this time of year. Layering with a cardigan is great for a nursing-friendly wardrobe. It's also a comfortable and flattering option for new mom bodies and can help to seamlessly transition an outfit from at-home comfy to out and about-appropriate. I love this soft cozy option, which is a flattering length and available in two great neutrals: soft gray and olive. 10. Cute cozy slippers - I think these slippers are the cutest! I'm a sucker for moccasins, for plaid, and for shearling, so these are pretty much the best... I also loved wearing slippers at the end of my pregnancy and those first few weeks after Hannah's birth. My feet were swollen and I was physically recovering, so I lived in cushy slippers when I was hanging out around the house.